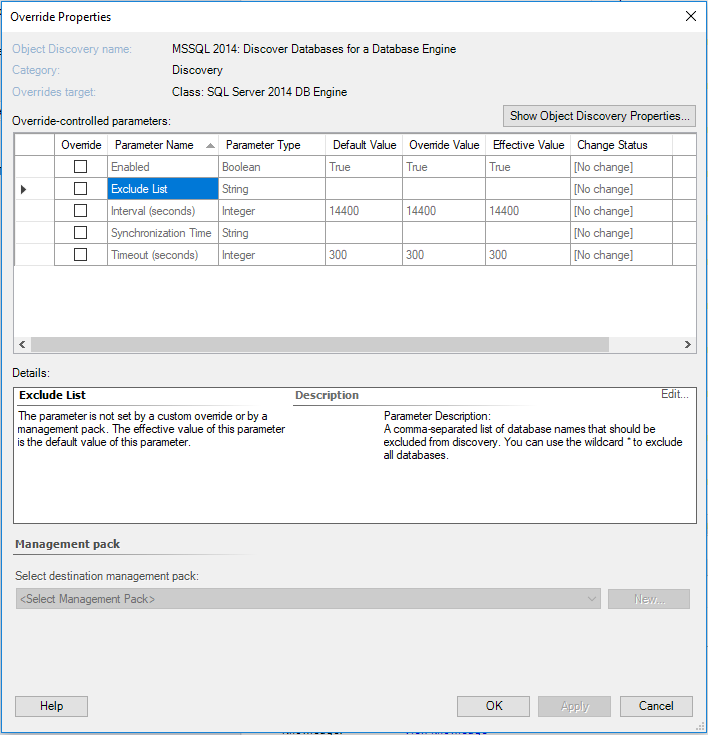 I recently wanted to exclude some temporary SQL databases from being discovered by our SCOM environment. These databases are created during a backup process and are always named “_Clone”. I’d previously excluded SQL Express instances by their name (Maps, Live, MSEE) and it worked a treat. However, this was done by their full name and not a partial name using a wildcard. 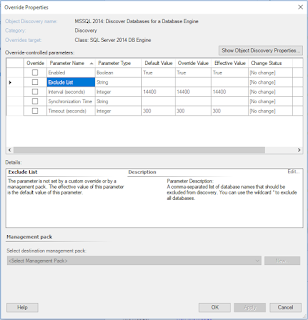 If you take the SQL 2014 discovery for databases, (MSSQL 2014: Discover Databases for a Database Engine), for examples and override it. You will see “you can use the wildcard * to exclude all databases” in the details pane. Why this would be included when you could just disable the discovery all together I’m not sure, but it seems almost criminal that you can’t disable discovery of databases or instances (the discoveries have the same options as this one) via a partial name. Something like “*_Clone” or "%_Clone" which would solve my problem and i’m sure its something other people would find useful? Try it again but removing the underscore character e.g. %Clone in SCOM the _ is often used as a place holder character. Not sure if this will help but try it to see.